Cornell Bread was introduced in the 1940s by Dr. Clive McCay, a professor of Nutrition at Cornell University. It was meant to be economical and healthful, with protein and nutrients from a special “formula” of soy flour, milk powder and wheat germ. Because Dr. McCay wanted flavor that would appeal to the masses, he used white flour rather than wheat. However, as the bread gained popularity, health focused bakers started incorporating whole wheat flour. Modern versions usually have a combination of flours along with the signature blend of soy flour, dry milk and wheat germ. My version falls into that category, but since I couldn’t find soy power I used hemp protein powder and made “Hemp Protein Powder Bread”. Like Jane Brody, whose shares her version of Cornell Bread in Jane Brody’s Good Food Book, in addition to the wheat flour I used a little more honey. I also halved the recipe to make one nice sized loaf. We love it! Fuzz has been eating it with turkey sandwiches and I’ve been using it for peanut butter toast. It’s a little denser than most yeast breads thanks to the protein powder, but it slices neatly and has a pleasant flavor. 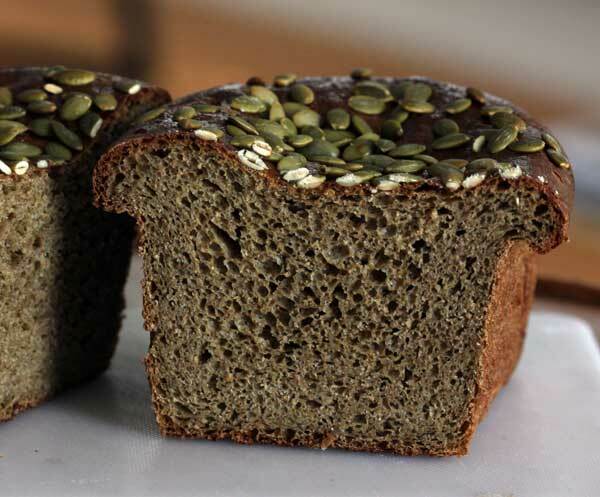 Hemp protein powder is a greenish color, so the bread has interesting, earthy hue that looks nice when topped with pumpkin seeds. This is how the dough looked right before I put it in the oven. And that was batch one. I’ve made it three times already with variations. For those of you who do not drink milk, I’m happy to say Hemp Protein Powder Bread can also be made by omitting the milk powder and using almond milk in place of some of the water. Here’s a picture of the results, though in this loaf I used a bit less flour (13.5 oz instead of 15 oz) and the top sank. I made the almond milk variation again with the full 15 oz of flour and had a nicer top. Despite the slightly sinkage, all of the variations worked and had a good texture. When we finally eat all this bread, I think I’ll try another variation from Mother Earth News. It is sweeter and uses 100% whole wheat flour. Jane Brody has another similar recipe that is sweeter and calls for the addition of oats. It’s called High Protein 3 Grain Bread and I think the hemp protein powder would work well in that, too. And finally, if you don’t have time to make bread but are interesting what I think is a pretty fascinating evolution of a bread recipe, here’s an article about Dr. McCay and is famous bread from the Soy Info Center. 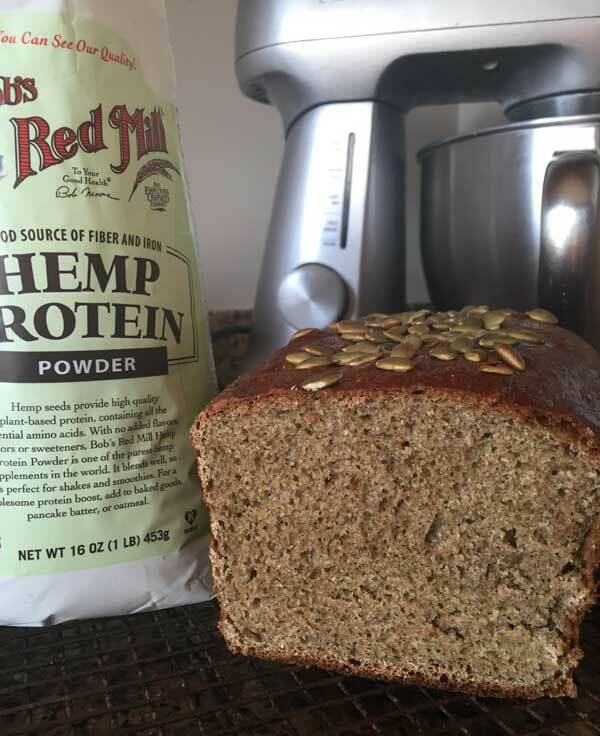 Hemp Protein Powder Bread is a twist on the old Cornell Bread which was made with a combination of all-purpose flour and soy flour. Grease an 8 1/2 by 4 1/2 inch (or a 9x5 inch) loaf pan and line with a strip of parchment, then grease parchment and dust pan with flour. In the bowl of a stand mixer, combine the flour, bread flour, wheat germ, protein powder, milk powder and salt. Stir well. Add the water/yeast mixture and the honey and stir until blended, then attach dough hook and allow the mixer to knead the dough for about 7 minutes or until it is smooth and elastic, stopping after a minute or two to scrape the side of the bowl. If dough is sticking to the sides, sprinkle more flour around the sides of the bowl. Dough should be fairly hefty and clear the sides. It should not be too sticky. Transfer dough to a greased bowl. Cover and allow it to rise for about an hour or until doubled in bulk. This could take an hour to an hour and a half. Punch down the dough, shape into a ball, then squish it into a brick shape and transfer to a loaf pan. Allow the dough to rise for another hour. 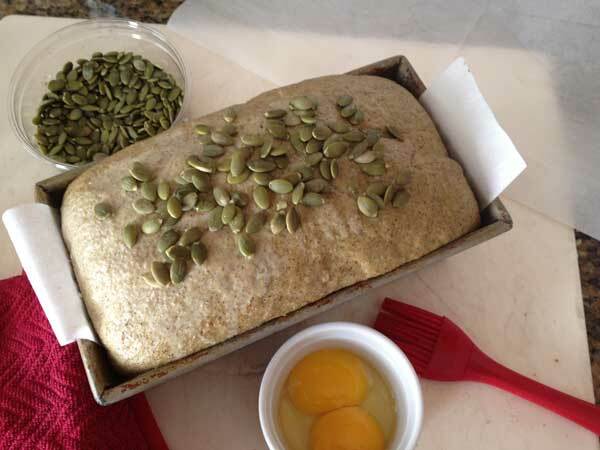 If desired, brush the top of the loaf with a little egg white and sprinkle on some pumpkin or sunflower seeds. Bake at 350 degrees F. for about 50 minutes or until dough sounds hollow when tapped. Let cool completely before slicing. Makes 1 30 oz loaf. If you don't have the dry milk powder and want to use regular milk or a vegan milk such as almond milk, omit the dry milk powder and use 1 cup of milk (or almond milk) and 1/2 cup of warm water. Dissolve the yeast in the half cup of water. In my experience, the almond milk version has a slightly less rounded top. Really interesting. I’ve heard hemp is good for you. Will have to try this.